Rose Mary Pupa Grasso, age 88, of Regency II Apartments at Friendship Retirement Community in Roanoke, Virginia, and formerly of Riverside, California, died Monday July 28, 2014 at Friendship Health and Rehabilitation. She was born January 24, 1926 in Rome, New York, to the late Frank and Anna Felice Pupa. 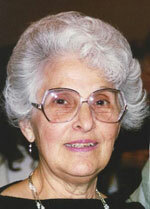 She was the registrar for the Riverside Museum and a member of St. Catherine's Catholic Church in Riverside, CA. She loved traveling, books and trying new things. She is survived by a daughter, MaryAnn "Maggie" Anderson and husband, Wayne of Millboro; two brothers, Frank Pupa, Jr. of Ojai, CA and Anthony Pupa of Hemet, CA; a granddaughter, Angie Anderson of Roanoke; a great granddaughter, Brianna Stroop; and three nephews. In keeping with her wishes, her body has been cremated. A memorial service will be held on Sunday, August 3, 2014 at 3:00 p.m. in the chapel of Nicely Funeral Home, Clifton Forge, with Father John McGinnity officiating. Honorary pallbearers will be The Marine Corps League Honor Guard of The Rockbridge Patriots. The family will receive friends on Sunday afternoon one hour prior to the service at Nicely Funeral Home. The family suggests that memorial tributes take the form of contributions to the Garth Newel Music Center, P. O. Box 240, Warm Springs, VA 24484.